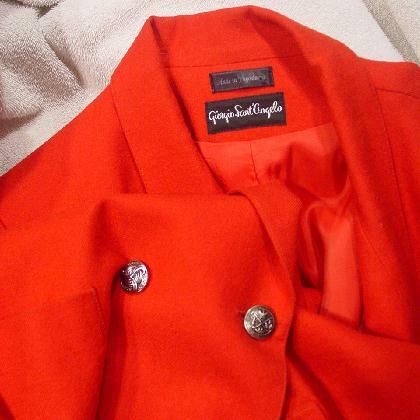 This vintage red 100% pure wool jacket was made in Yugoslavia and is by Giorgio Sant'Angelo. 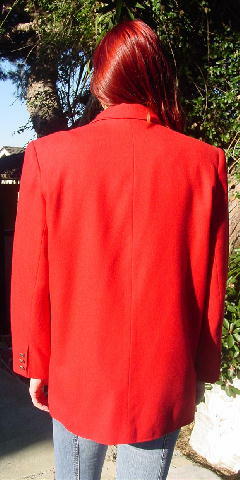 It has a long collar and lapels, shoulder pads, and long sleeves. 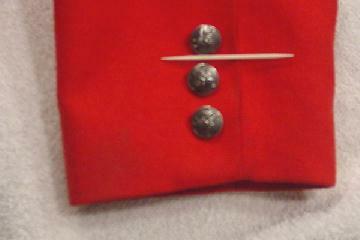 The front has two large open pockets and two different design metal buttons. The long sleeves each have three smaller decorative buttons which match the inner front larger button. The back bottom edge of the left sleeve has some darkening which goes upwards in areas to the middle of the second button. 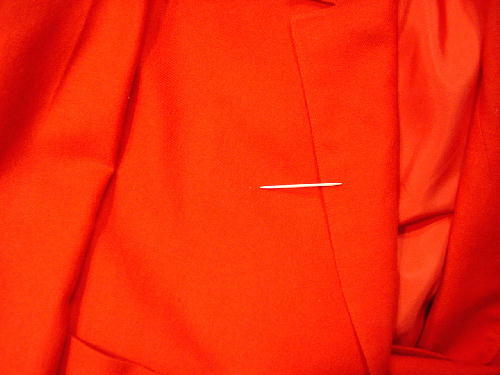 There is also a light dot spot (a little bigger than a pencil point) which is 7" up from the top of the right pocket. It has a lighter red synthetic full lining. The tag says size 14, but it fits more like a size 12/14. It was worn in several movies with the spots and different front buttons. shoulder to shoulder 17 3/8"
shoulder pad to shoulder pad 18 1/2"
bottom hem side to side 21 7/8"